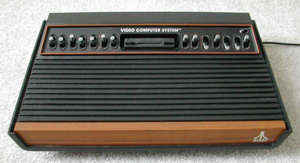 An Atari 2600. It is interesting to note that this system is the later released the fifteen switch design designed to cut back on the previous 16 switch design. Atari 2600 was a "Video Computer System" created by Atari in the late 70s as an attempt to prove that it is in fact possible to sell something substandard and make tons of money despite having failed at it before (see Atari 1300 project). Using chips from various pong systems, the 2600 was able to display over three rectangles at a time and keep score for numbers ranging from 0 - 14 before crashing due to register overflow. 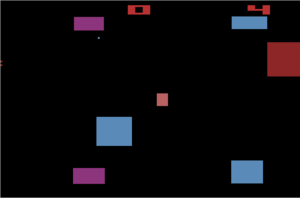 This caused the common color flip of death (CFOD) signifying the end of a game, although Atari claimed that it was a feature designed to prevent television screens from freezing over (known also by its technical term "ghosting") with the rather static graphics. Also Atari kills you in your sleep. 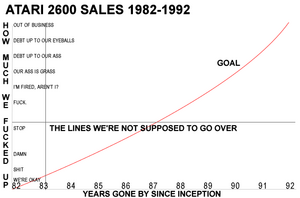 The so-called experts at Wikipedia have an article on Atari 2600 much funnier than this one. A prototype Atari 2600 Joystick. The actual design and the preliminary design show much in common. The Controllers of the Atari 2600 were designed with great care. Knowing that computers are different than video game systems, the team decided to create a different controller style that is much simpler to use. 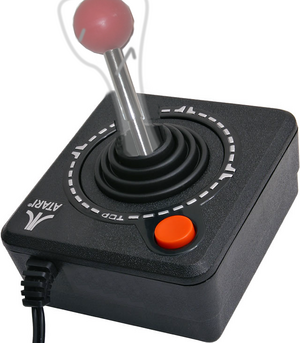 The decided upon design was a joystick ripped from an arcade machine from Atari headquarters. This joystick was put into a small box and a rubber casing put over it after removing the upper ball to prevent Nolan Bushnell from suspecting that they stole it. A single button was added so that players could activate something on screen. Any more buttons added would cause quote "confusion" for the consumer, as labelling buttons was not invented until the later 80s when Nintendo decided to be daring enough as to add one other button. Because the design team knew that consumers wanted to be far from the television screen, a two inch cord was added to the controller as an afterthought. The Atari 2600 has the capacity to make the ghosts flash when you play pac man to give you a harder challenge. It can also force you to stay in a pit in E.T. making sure your gaming experience is awful. It has been heard that it also makes good fire material. If you put it in your toaster, you'll have a more joyful experience than if you play it. You can also microwave your joystick or smelt it on your atari 2600 console to make it look like a building or a pile of crap. In order to cut down on cost so enough budget would be saved in order to go to the local pub later that night and drink a few Millers, the team decided on using the already almost 10 year old Intel 8080 processor to power their machine, and 128 bytes of memory. The idea of using a better processor stripped from the Commodore 64 was scrapped as too expensive. Because of this another issue was raised - the processor was too damned slow to actually make anything worthwhile with the entire screen, so they advised programmers to only use 1 fourth of the television screen on the lower left corner and leave the rest blank. Although this would cause the obvious issue of freezing a blank strip on three fourths of the screen if played too long, the development team needed a drink, and that's what matters in the end, so it was done. The development team also considered adding a graphics processor. However, in order to save money they simply used a dummy chip. That forced programmers to generate video in software, meaning there was no processing power left to make an actual game. Also, the development team decided not to put a video out on the console, opting to use an RF modulator and confusing switchbox instead. Nowadays several AV modifications have been made, but because of the way the Atari generates its video (see below), none of them work very well (or at all). Game makes all the graphics for that line, then pauses. Contrary to popular belief, it is not stored in RAM. A custom chip, and a crapload of resistors and capacitors (the most expensive part of the 2600) combines all the signals together to form something kind of resembling an image, sort of. The Red Button on the bottom left corner (no one knows what this button does, even today it is known as 'the Red Button'. However, a child once claimed he pressed it and it killed Walt Disney. To compound problems the system was not shipped with a manual, but rather a pamphlet on purchasing a VHS edition of Young Frankenstein. The developers later decided after several million were sold, that they should decomplicate things by removing the on/off switch. The new unit was shipped out and sold for the rest of the life span of the console. Besides the switches, another notable and novel idea only followed by the Atari was the fact that the controller ports were mounted on the back of the machine rather than the front. This idea came to mind because all computers of the time had all cords mounted at the back of the machine. Why shouldn't controllers? Besides this, it was generally believed that people would want to stare at the graphics up close and personal rather than further away, even with 12 inch televisions. This design was generally believed to become a pioneer design for all future consoles. One of the console's games, Pac-Man, was believed to be the whole start of the video game crash of nineteen eighty four. nasty. nastynastynastynasty. N. A. S. T. Y........oops, i overdid it. After the demonstration at the Consumer Electronics Show, the system's sales exploded, resulting in the need to recall four thousand potentially explosive cardboard boxes, causing potentially deadly or scarring results. Despite this setback, 12 billion units were sold within the years of 1979 - 2006. An estimated 400 billion 8-Tracks were sold additionally between these years, half of which ended up in a New Mexico landfill (YES WE'RE TALKING ABOUT YOU, E.T.!!!). The other half was set off on a barge to the Samoan Islands after New Mexico threatened to pour concrete down Nolan Bushnell's throat. An estimated 2 million natives of the Samoan islands died as a direct result of attempting to ingest, cook, or dispose of said cartridges. Atary (Atari 2600 prototype) actually features Full HD 1920x1080 upscaling on regular SDTV TV-set and built in MPEG4 decoder. Here are a few examples.